Those made by hand and those made by machine. Silk duvets made by hand are superior in quality, durability and hypoallergenic qualities to those manufactured by machine. Handmade silk duvets are almost always made using long fibre mulberry silk. The mulberry silk is stretched by hand and layered in a grid pattern until the desired weight is achieved. The silk is then enclosed in a casing and usually tacked to prevent any movement of the layered silk. Silk filled duvets manufactured by machine are almost always made using short fibre silk or a silk and polyester mix. 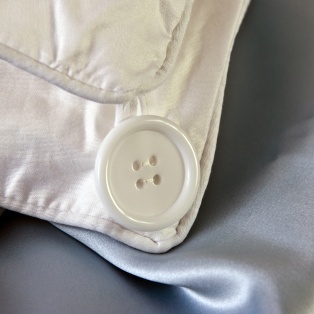 Short fibre silk can be wild silk or any silk off-cuts which are then forced into a duvet casing. Filled using long fibre mulberry silk layered in a grid pattern. Tacked, not boxed stitched. Tacking the silk down eliminates cold spots and the damage box stitching causes to the silk fibre. Less airborne fibres because only long fibre silk is used. Silk fibre stuffed, not layered into a casing. Box stitched. Box stitching damages the silk fibre and creates cold spots throughout the duvet, undermining a silk duvets heat regulating ability. Just a word of thanks for sending such a good product so promptly. Business at its best!